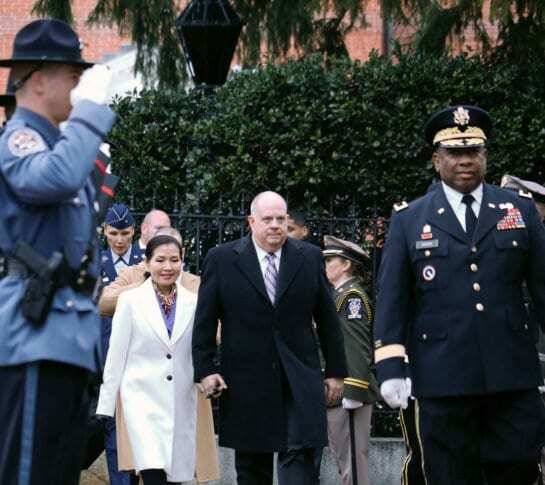 Hogan emphasized bipartisanship on Wednesday in his second inaugural address and contrasted civil debate in Annapolis with the partisan rancor in nearby Washington. Gov. Larry Hogan says he wants to seek the “middle ground where we can all stand together” in his second term. Gov. Larry Hogan has been sworn in to a second term. Hogan was sworn in Wednesday by Maryland’s Chief Judge Mary Ellen Barbera in the state Senate. Lawmakers and judges on Maryland’s highest court attended the short ceremony, which was closed to the public. Hogan will be sworn in publicly on the Maryland State House grounds early Wednesday afternoon. Hogan is the second Republican to win a second term as governor in the state’s history. In a rarity of Maryland politics, a Republican is being sworn in to a second term as governor. Gov. Larry Hogan will be sworn in Wednesday on the grounds of the Maryland State House. Hogan is the first Republican governor in Maryland to win re-election since 1954, when Theodore McKeldin became the first Republican to do so in the state. Democrats outnumber Republicans 2-1 in Maryland. The ceremony will be unusual for another reason: it will be held on the northwest lawn of the State House. That’s because the mall in front of the Capitol is undergoing construction work. Hogan is scheduled to attend a prayer service in the morning at St. Mary’s Church. That event is invitation-only. An inaugural gala is set for the MGM National Harbor casino.